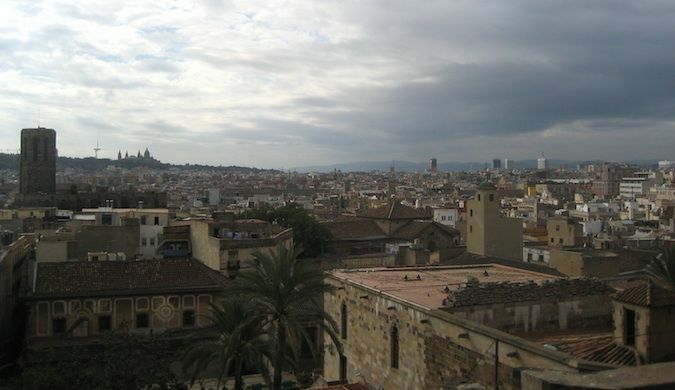 My first visit to Barcelona was in 2006. I fell in love with the city: the street performers, food (oh, the food! ), laid-back lifestyle, history, people, and plethora of activities. Three years later, I returned again. Then a few months ago, I went back with a friend to show her how amazing the city is. And every time I come back, Barcelona surprises and inspires me anew. Barcelona is like Paris, New York, or Tokyo — there’s always something to do, and you’d need a lifetime to do it in. But as tourists we don’t get a lifetime to see a city. We get a few days, maybe a week or two if we’re lucky. We see as much as we can before we move on. So for those with limited time, what can we do? How can we maximize our time in a place like Barcelona where there’s just so much to see? Well, like I’ve previously done for Bangkok, New York, Paris, Berlin, and Helsinki, I’ve created an itinerary to help you organize and maximize your time in this incredible city. Barcelona History Museum — Barcelona has one of the best city history museums I’ve ever been to. 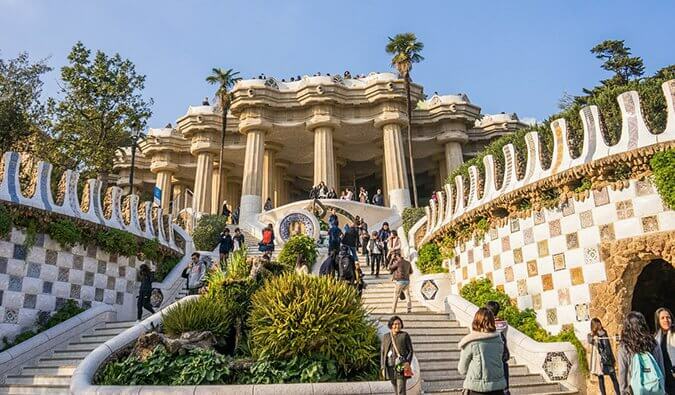 It does an incredible job of explaining the history and importance of Barcelona and has over 4,000 square meters of Roman ruins located beneath the museum that you can walk through. It’s spectacular. There’s a free, detailed audio guide and descriptive explanations of what you’re seeing. Picasso Museum — While I’m not a huge fan of most of Picasso’s later work, with over 3,000 pieces of art, this museum has a lot to see, and even I was happy. The Gothic Cathedral — Located in the heart of the Barri Gotic, this Gothic cathedral was built on top of an 11th-century church. 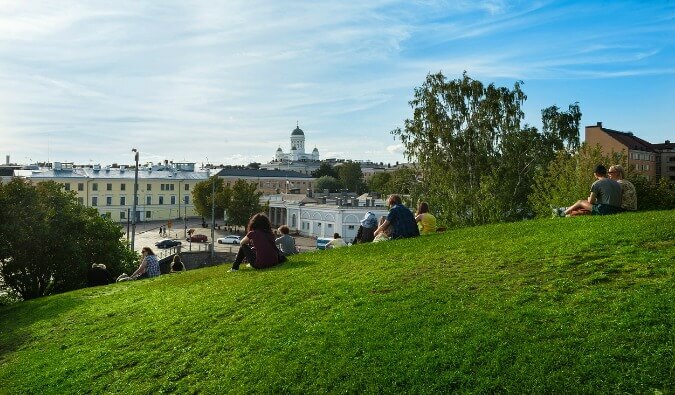 You can take an elevator up to the roof for sweeping views of the surrounding historic area. Barcelona Museum of Contemporary Art — In the Raval area of town is the city’s modern art museum. It has hundreds of exhibits, especially from Spanish artists. If you love modern art, it’s worth a stop. 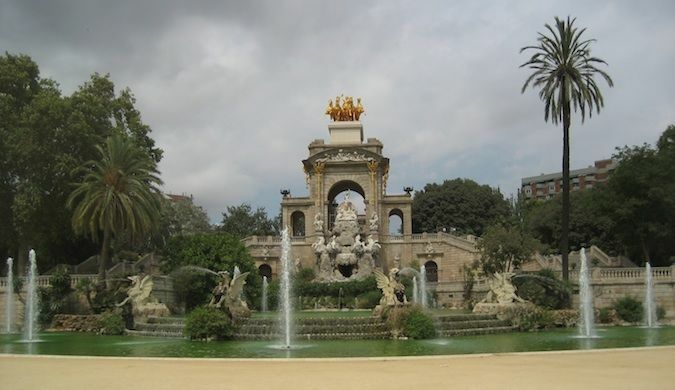 On the complete other end of the Barri Gotic (it’s a beautiful walk through the historic streets, so you’ll enjoy it) is the Parc de la Ciutadella. I became a huge fan of this park when I stumbled upon it in 2009. I absolutely love the art and fountain here. Gaudi designed the famous Cascada Fountain when he was an architecture student. On a warm day, I just like to sit and stare at the fountain. There’s also a zoo in the park and some short walking paths. Take a bottle of wine, grab some ham, and have a picnic. Barcelona has some of the best food in Spain, and there’s no better way to spend your morning than learning about the food culture of the city. 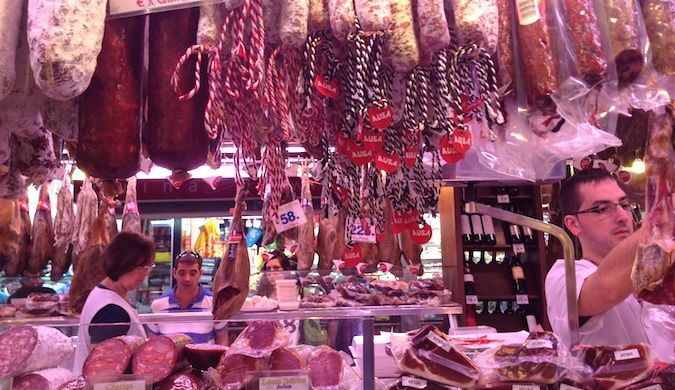 I strongly recommend Context Travel’s food tour, which takes you around the Barri Gothic and the food markets there to highlight the food history and delicacies of the region. One of the most informative and delicious tours I’ve been on in a while; it’s not the cheapest food tour in the city, but I got everything I paid for. 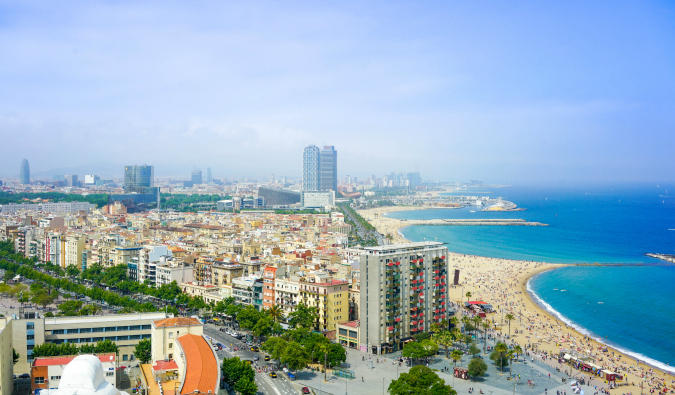 No trip to Barcelona is complete without a visit to its famous beaches. After you’ve gorged on food, siesta all day on the beaches, work on your tan, and relax with all the locals who had the same idea. Day 1 was a busy one, so make day 2 relaxing. Lunch — Take a breather (and a late lunch). Walking tour — While still in the Eixample area, you can visit all the other Modernista movement sites. While Gaudi was the most famous architect of the movement, Barcelona is full of Modernista-style buildings by other great architects. You can identify the buildings by the red circle in front of them on the sidewalk. You can also take the Context Travel tour about the movement or simply download a mini walking guide and do it yourself. 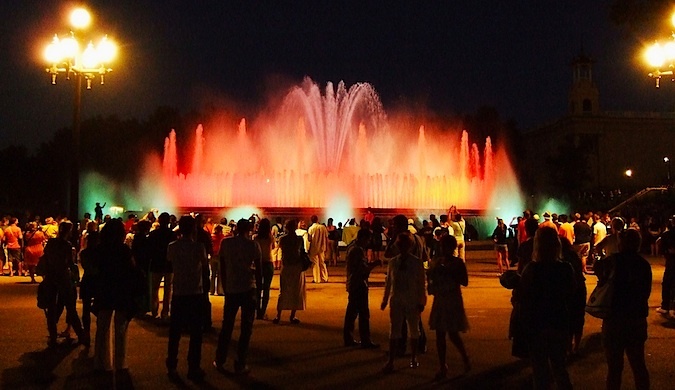 On Thursdays, the Plaça d’Espanya has fountains and lights that line the street towards Montjuïc Hill. At the end is the Magic Fountain of Montjuïc, which puts on a spectacular light-and-water show. 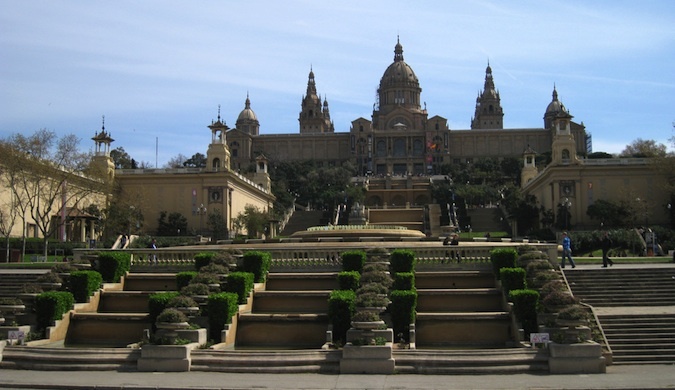 Afterward, walk up the hill to the Museu Nacional d’Art de Catalunya for an expansive view of the city. This is also a great place to take a date. Uber-romantic! The 1450-meter long harbor aerial tramway with red cars connects Montjuïc and Barceloneta. It starts near the beach on top of the 78-meter tower and takes you all the way to Montjuïc Hill. Montjuïc Hill — When you arrive on the hill from the cable car, you’ll be able to enjoy a good view of the city and visit the Castell de Montjuïc (a large 18th-century fortress), as well as gardens, a Spanish village, and some Olympic stadiums. There’s a lot to do here, so you’ll have plenty of choices. The Catalunyans take regional pride very seriously. They’re Catalunyans first, Spaniards never. It was no surprise to me then to find a whole museum dedicated to art of the region. Since it’s high on a hill, you can use the museum’s patio to take pretty epic photos of the city. See anything you haven’t seen – didn’t get time to visit some other sites or museums, or walk through some neighborhoods? Spend your afternoon doing that! The first “football” game I ever saw was in Barcelona. It was Espaynol versus Valencia. I still have the shirt I bought that day. Barcelona’s two teams are Espanyol and FC Barcelona (one of the top in the world). Learn to cook — Since Barcelona is such a food-centric city, if the normal sights and activities bore you, take a food class. There are many one-day cooking classes offered. Day trip to Figueres — This region is home to Dalí, and you can take a day trip to Figueres, where you can visit the Dalí Museum, featuring some of his most famous works. You could squeeze in the real highlights of Barcelona in two or three days, but taking five (or six) for the above itinerary gives you enough time to gorge on Iberian ham, tapas, and sangria while not rushing around. Barcelona moves slowly: dinner’s at 9, you’re early to the bar if it’s before 2am, and everyone sleeps late and loves their siesta. And since this city moves slowly, so should you. Sleep late, take breaks, eat lots, don’t rush your visit, and just enjoy Barcelona — at a Spaniard’s pace! El Borne is my favorite neighborhood! Aaaaaa I have a 12-hour train “layover” on my way from Spain to Paris next week and this is JUST what I needed! I guess I’ll start with the Barri Gòtic and try to work my way through this itinerary when I go back for a legitimate weekend trip in February. Thank you!!! Trevor, with only 12 hours, if you want to see the big ticket items, you should try one of the big bus tours. I know it’s a little too touristy for most people, but when you have only a few hours, you can really see so much of the city and hear about the history for a reasonable price. I had a day in Barcelona last year and really enjoyed the bus tour. By the way, Barcelona may be my favorite city in Europe. Have a wonderful time! Great suggestions all round. I’ve been five times now and there’s always things to see. I would recommend, if people have the time, they visit Montserrat for the day; a beautiful mountain monastery that’s easily reached. Yep, love Barcelona too. If you drink from the Canaletes Fountain in La Rambla, legend has it that you will return more than once. I drank from the fountain, and that legend became true for me! Spain always gets left off my Euro itineraries and I don’t have an excuse why. I probably don’t know enough about their history but those Goudi places…. Wow! Great suggestions! I love Gaudi’s style, I wish houses today were designed as fantastical as Guadi’s casas. You’d feel like you live in a fairy tale! 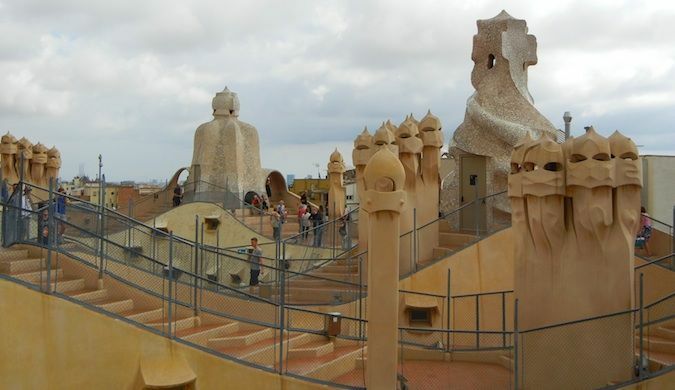 Totally agree Gaudi is spectacular – If you want to learn more about the work of Gaudi before you visit Sagarda Familia, Casa Battlo and La Pedrera a great place to start is The Gaudi Exhibition – but book your tickets in advance to avoid any queue. Make sure you read The Shadow of the Wind! It is the most exciting and magical crime story that happens in Barcelona. Thanks for the tip! I’ll check it out! I always need a good book. Although I am not familiar with Barcelona, I do know other parts of Spain really well. 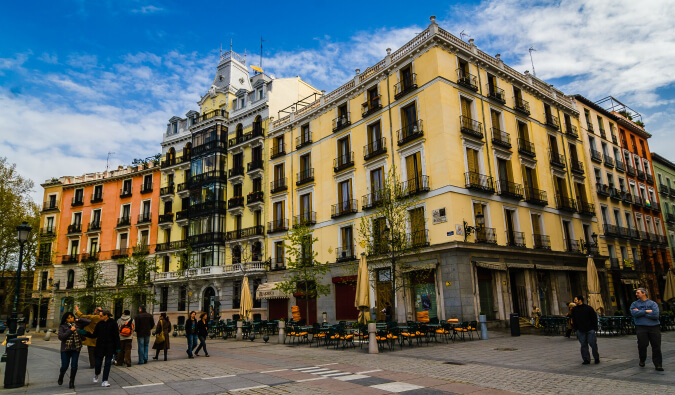 Having lived in Spain for about a year and half, it easily finds a spot on my list of top five favorite places in the world. In fact, I return again in February 2013 for another six weeks. This time to attend language school in Malaga. I will also enjoy one of my preferred cities, Granada. I plan on passing a few precious days in the little coastal town of Torre Del Mar as well as returning to my longtime stomping grounds in the whitewashed-mountain village of Competa. Clearly, improving my Spanish makes sense, as I plan to return to Spain for many years to come. As a world traveling international house sitter, I have been blessed to discover Spain. This is a very timely post for me as I have a tripped to Barcelona planned next year! Really looking forwards to seeing the Gaudi works and I think a trip to the museum and ancient ruins will definitely be on the agenda too! Have a great trip! I love the city! Yes! This is my favorite city in the world. I have to admit that one of my favorite things to do there was to go out to the discotecas at night, especially the ones by the beach. I also miss La Boqueria soo much–I loved drinking gazpacho with a straw and wandering around. I think he was smoking some serious pot! Gaudi’s work is truly a must see for anyone traveling to this area. It’s very unique and unlike anything I’ve seen before. 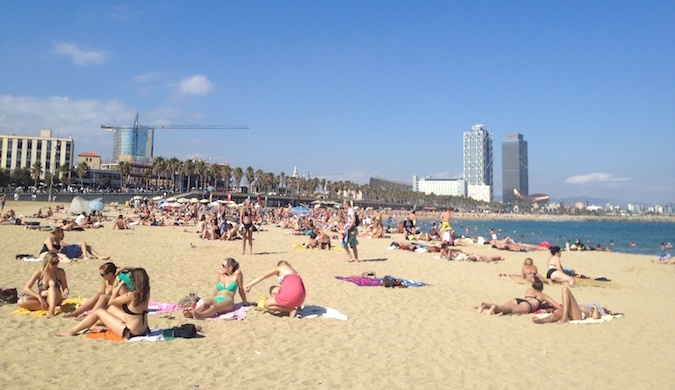 And yes, of course enjoy the beaches when you travel to Barcelona. I managed to squeeze in most of those things in 3 very very rainy days! Hopefully I can make it back there one day with better weather. Would love to see the beaches and do a food tour! Very true, I would definitely nominate Barcelona to be included in the same breath as Tokyo/London/Paris/NewYork. I found myself hanging around longer and longer. Pricewise its also manageable in that you can find hostels for as low as 10eu. You could take getways along Costa Brava if you find weekend accommodation costs too high for your taste. I have to second a trip to the Gothic Cathedral! I was just there a few weeks ago and it was gorgeous, plus it has an open-air outdoor section (crypt? we weren’t sure but there were names & dates engraved on the floor) with lush trees and ducks enjoying a stone reflecting pool. We managed to pack in most of your suggestions, which are all great. It was my first trip to Spain, and I found Barcelona very accessible. The subway system is especially easy to use. I definitely recommend the beach and just wandering the cobbled streets. Can anyone suggest a Spanish language school in Barcelona? Matt, I love Barcelona too! For me, the high light was the Context Food tour and the Gothic Quarter. Can’t get enough of that area. Gaudi is pretty magnificent too! Also, a side trip to Girona would be worth it. times, once living there for a month and a half, it is delightful. Love the dancing at the Bario Cathedral in the the Gothic Quarter on Sunday morning. The street festival, Major de Gracia in the Gracia district from 15th-21st August with all the stationary float style decorations is a treat. Don’t miss the Miro museo on the hill where the Olympics were held. Great view from there. Be sure and have paella. I visited Barcelona this past April — in fact, was staying over the weekend of The Day of Books and Roses– and I LOVED IT. I had great expectations of my visit and I was NOT disappointed. It is a very large and lovely city, and difficult to see on a short trip, but you have hit many of the best features for the short stay. I took a bicycle tour and was able to visit quite a few places; paid to view the Gaudi works La Sagrada Familia and Casa Batlo… well worth it. His only major work outside of Catalunya is in the coastal town of Comillas– the Sunflower House! I got to see that in 2010. His architecture is fascinating even if you don’t care for some of its visual “charms” because if you tour his work, you will sense his immense genius. The parks, the transportation (so easy! ), the shopping and food, and the PEOPLE! Lovely lovely lovely. Get to BCN and if you will probably always want to return. I spent a week in Barcelona this summer, whish that I had some of these tips then! WATCH OUT FOR THIEVES. My travel partner had her entire bag stolen from right next to her as she was sunbathing on the beach (it was the second time that’s happened in Barca to her too…). Just be smart! You need to try cava, its like champagne but waaaay cheaper because its made in spain. I got a full size bottle of it at la boqeteria for less than 3 euros. Cheers! p.s. it has a great couchsurfing community. Agree 100% about the THIEVES in Barcelona. When we made our report at the police station it was FULL of vistims with similar stories! Yeah, there are a lot of petty crime in that city. You really do need to be careful! I just spent over two weeks in Barcelona and although I didn’t go over it as Matt suggests here, I think I managed to cover pretty much everything worth seeing (even while working on the road some days). Even took a bus from Plaza Catalonia in downtown straight to mount Tibidabo, where besides the uphill church that can be seen from anywhere in Barcelona there is a legendary amusement park which is a hit with locals on weekends. If I had to compare Barcelona’s vibe to that of an American city, the closest match would be San Francisco. The Sagrada Familia basilica is worth visiting on mornings when sunlight reflects upon the stained glasses and the interior in full glory through – booking online will save you time and aggravation from crowds. Cool post Matt. I am from Bracelona, also travelling around the world. Missing my city though. If you don’t mind, I will link your post on the website that I’m working on “whattodoinbarcelona”. There’s always a good reason to see Barca! As a student, you forgot to mention nightlife. I would suggest anyone looking for great bars or dancing should definitely visit Port Olimpico. It’s right on the beach. There’s a great Ice Bar and Irish pub I’ve been to out there. There are also some great absenth bars off of Las Ramblas and another international friendly Irish pub. If you head to Les Corts area, which is near the staduim, look up this great club called Sutton. You’ll have a great time there it’s huge! And anyone visiting the Gaudi buildings in Paseig de Gracia should stop for lunch at this great little restaurant called Ciudad Condel. I always recommend it! Their tapas are great and cheap. (I always get veal there). It’s on the corner of Ramblas de Cataluyna and La Gran Via. One last tip. Try to go to Barcelona during el Clasico. I’m a huge FC Barca fan so I actually went to the game ( best night ever). But if you happen to be on Las Ramblas when they win that game be prepared to party like a Catalan. They go nuts and swarm the street with chants and fun! Any suggestions on where to stay. I’m heading to Barcelona in May, and I’m going to use your post as my itinerary. I’m traveling alone, so your suggestions have eased my anxiety about what to see and do, without missing out on anything major. I like Kabul, Hello BCN, and St. Christophers. If you aren’t into hostels, there are a lot of budget hotels in el Ravel. You left out City History Museum, Matt! I think, it’s one of the best Spanish museums and is definitely worth a visit, if someone’s into history, like myself. oh! All the tips you wrote are amazing! In addition I would add go to Nello’s Bar, an amazing restaurante where you can eat one of the best burgers of Barcelona!! Barcelona always woths a visit all year round. You always have something to do to have fun. We recommend Eclipse Lounge Bar at the W Hotel to have a very good cocktail over the city. If you want to have an special dinner, you should go to “Els 4 gats” a modernist restaurant, and you can not miss Sagrada Familia if you like modernist architecture. I’m glad I can always be helpful! hey matt i am planning to visit barcelona and unfortunately i’ll be doing it solo!!! would i be able to enjoy it just as much and is it easy to meet new people? Designed goods. We’ve been living here for 4 weeks now and Gracia is Barcelona without the tourists. Great job Matt! I always check your site before taking a weekend trip. I live in Germany, so I can make it out at least once a month to many of the top European cities. I enjoyed Gaudi immensely and thanks for the tip on the red circle in front of the buildings. It was an ace up my sleeve in arguments with the girlfriend. As far as places to eat, I really enjoyed cerveceria catalana. Although the service was a bit rough around the edges, the tapas were the best I had in the city. Also, for nightlife, taking in a flamenco show can be a great way to spend an evening. Yes, I know, Flamenco is from Andalusia, but to me the talent was excellent, even if it’s not a Catalan original. Los Tarantos is only 10 euros and afterwards you can hang out in Plaça Reial, which is a great place to have a beer or Sangaria after dark. Also, eat in El Borne, best food neighborhood in Barca. Also, Quimet & Quimet is one of a kind. For seafood hit up Barceloneta, and you can’t visit Barca without checking out the nightlife, it’s hedonistic. How easy is it to get around Barcelona as a non-Spanish speaker? really really good tips ! Thanks you such a great article, i love barcelona so much. I’m planning a new trip to barcelona soon ( parties are amazing in spain ;). 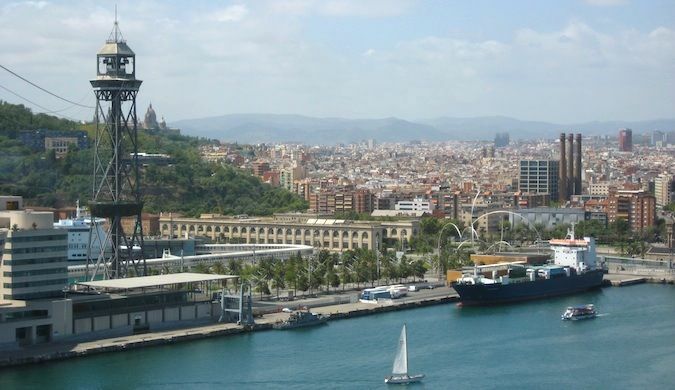 We’ve booked an apartement with BarcelonaPoint, good website ! This October, Probably i am planing to go Barcelona or maybe November depending on La Liga Schedule of El Clasico btwn Madrid and Catalans. As none of my friends are football Fanatic (Sad) so this will be a solo trip. Is the Barcelona Card worth getting in your opinion for a 5 day trip? How much money does it really save you? Great post, maybe you left your ride around Passeig de Gracia where the most famous shops in the city are located. Going for a few days in June and this post was a great summary of how to spend 2 days. Much appreciated! I will do going to barcelona on July 14 and my husband can not join me on the first 3 days. I should see this city alone.What is your suggestin? Hop on hop off is a good idea? I will be taking a Mediterranean cruise in August 2016 from Barcelona and I wanted to explore Barcelona and other parts of Spain after my cruise? Do you have any suggestions. I am interested in visting their leather warehouse, immerse in the culture, and try the food. Any suggestions would be appreciated. Barcelona is a gorgeous city! 2. El Parc Guell. Even though you have to pay to see everything now, it’s well worth it. 3. Montserrat (a 30-50€ day trip to hike on marvelous hills, see Catalunya from one of its highest points, and visit an antique monasterio). These three things are really unique, and are well worth the trip. Then, if you like to enjoy more common things too, I can recommend chilling on the beach (Sitges and Milanova are my favourite), and the Barceloneta nightlife (if you like big clubs like I do!). Hey Matt, (or anyone else who knows) how much euros do you recommend having in order to do all of these things in Barcelona for 5 days? Very good itinerary for a trip to Barcelona. However, if you are on an extremely low budget but don’t want to stay in a hostel, consider staying at nearby resorts of Costa Brava (Calella, Tossa de Mar, Lloret de Mar). The resorts are just 1 hour away from Barcelona centre, but hotel prices start as cheap as 10 EUR per person per night for room only or 15 EUR for Full Board catering at 2-star hotel. Barcelona is a great place for vacation place in Spain. As a football fan when we are thinking about Barcelona the first thing came in our mind is the primera division Spanish football league, commonly known as La Liga and Football Club Barcelona. I love Lionel Messi and when it’s about spending 5 days there I must recommended I La Liga match specially of FC Barcelona. Thank you. Also, you’ve been to the Espanyol Stadium, quite epic! By now they have a new stadium, built a bit south of Barcelona. 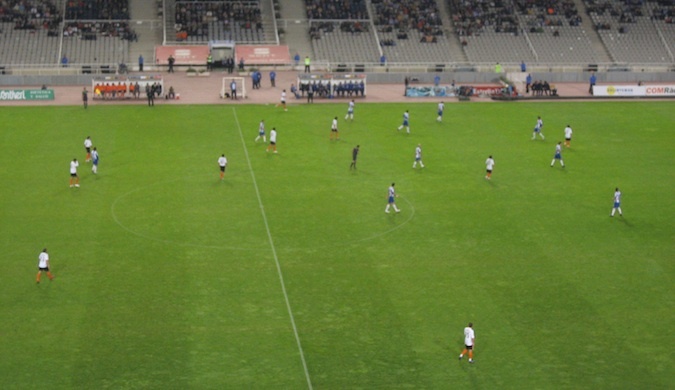 I prefer Barca, but either way, it’s an awesome experience – seeing any football match!! I was actually just writing my article on a week in Barcelona, this is how I ended up here. Thanks, Matt, as always your articles are awesome – even back in 2006! !